After over 30 years in the wine business in both the UK and in France, as a Vintner in the UK as well as a member of the Circle of Wine Writers,Guy Boursot is well placed to write articles for magazines and websites. Please contact Guy directly if you should like to have an article written for your publication. His overall style is informative but entertaining. Guy Boursot is highly qualified. Over the last 30 years he has given well in excess of 1,000 talks and is fortunate enough to attract a good number of requests for repeat talks. He has appeared on both radio and television and as with his writing, his style is friendly and entertaining but informative. 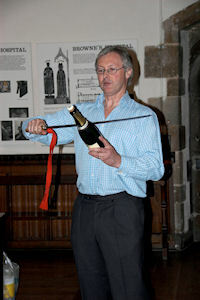 Whether for a corporate event or for a group of friends who would simply like an excuse to get together over a few glasses of wine, call or e-mail ardres@boursot.co.uk and Guy will be pleased to discuss your requirements and to come up with some original suggestions to create a memorable and fun event for you. Some of Guy’s most requested topics, thanks to his heritage (see this link) and experience, are Bordeaux, Burgundy and Champagne and this generated a quote from one agency: "To hear Guy talk on Champagne or Burgundy is to truly appreciate the knowledge and pleasure derived from centuries of winemaking." But he also speaks on any wine subject, ranging from the latest trends in the wine world to the up-and-coming wines of the south of France. Wine, wherever it is produced, is and always has been Guy Boursot's passion and he will travel as far and wide as his clients request. "I have known Guy for many years, and invited him to speak and present at an exclusive Champagne Dinner at The Bath Spa Hotel. The whole event was a huge success; his choice of Champagnes to match the food, his presentation and talk through each wine with each course was interesting and entertaining, so much so that I had several requests for Guy to return. 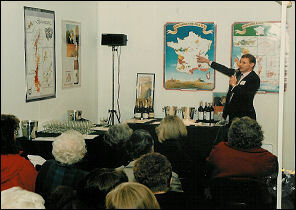 Guy's success is in his knowledge and passion for wine generally, and his ability to hold an audience with humour and tuition in equal measure - it makes for a memorable event. I have no hesitation in recommending Guy." "Thank you for last night, you turned the evening into a really great occasion. The phone has been ringing all day with guests thanking us, and many emails expressing gratitude. You have been described as impressive, charming, cool, very knowledgeable and the perfect presenter!!! Don't let that go to your head! Thank you so much for everything, your excellent choice of wines was echoed in the fact that the slop jugs on the tables were all virtually empty!" 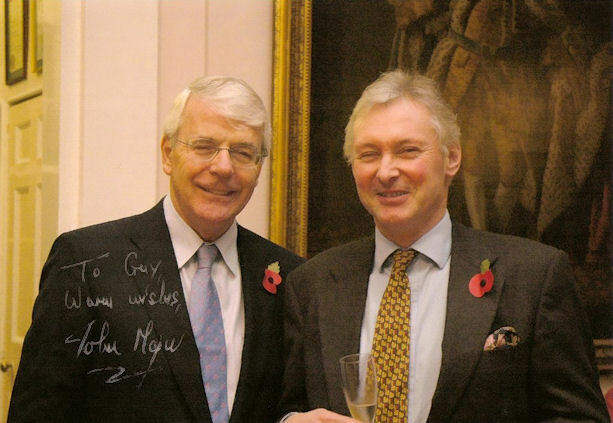 "Guy, my thanks again for an interesting and engaging lunch on Tuesday. We all enjoyed it immensely and as I suspected all were tempted to buy the wines you introduced at the lunch. On the journey home there was discussion on arranging another trip early in the Summer." "I am receiving thank you notes almost on the hour and you have been listed in one as "hard to beat". So consider yourself congratulated. With renewed thanks for your professionalism and easy style." "I have to say that you gave today one of the very best presentations I have ever heard. You enraptured everyone with your passion, knowledge and easy style - you even managed to hold the interest of those in the audience who do not drink wine! Many, many congratulations on a wonderful achievement." "The lunch was a great success we thought, certainly the six of us very much enjoyed ourselves and the other tables seemed to be occupied by beaming faces. It was nice to start with the bubbly in the garden and there was some good mingling too. It was a nicely informal event and Guy hit just the right note with his information about the wine - we all thought he did it extremely well, interesting but not preachy, not everyone has the knack of this but he does." "Quite apart from your knowledge, you clearly have a passion about sharing that knowledge in a very digestible manner." 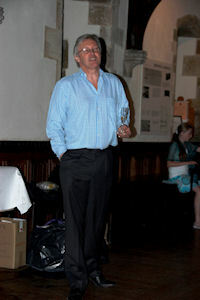 "Your presentation on Monday was a triumph and a great hit with members. Thank you so much for coming all the way across (or under) the icy Channel to give it. We had never done anything like it before and you could see how much everyone enjoyed it. You wear your expertise so lightly that I don't think it was until much later that people realised how much they had learned from the evening. Thank you very much." "Thank you so much for your masterful presentation last night. 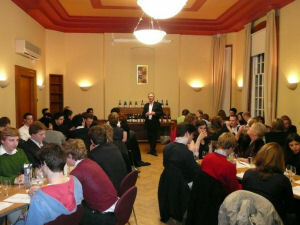 Everyone thoroughly enjoyed it and the wines we tasted were delicious and very good value I thought.... I hope we may be able to do something similar again - I thought it was a good way to entertain clients on an informal basis." "Thank you so very much for the excellent wine-tasting last Thursday... It really was an excellent and most instructive talk, and we would love to have you back." 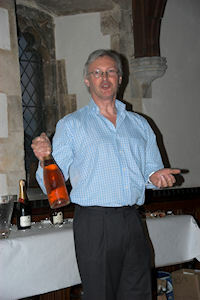 "Thank you so much for coming to our Society - people are still talking about how much they enjoyed the evening... both for the quality and range of Burgundy wines to taste and the relaxed and knowledgeable way in which you presented them to us (indeed, it was so thorough that there really weren't too many follow up questions)." "The reason why we ask Guy back year after year to talk to us is that not only does he have a genuine knowledge and passion for wine which will become self-evident when you hear him speak, but he also talks in straightforward language that we can all relate to and understand."